1) Where are you from? And what do you do? I'm from Cumberland, Rhode Island originally but have lived in the Boston area since graduating from Boston College in 1998. My wife and I just moved to Salem, MA at the beginning of the summer. I work as a tax consultant/attorney for KPMG LLP in Boston. 2) When was your first tri? What race? My first triathlon was the Boston Triathlon in 2005. I had just bought a new bike and loved riding. A friend suggested triathlon since I swam competitively until I was 16. I did horrible and during most of the race wondered why I listened to him? When I crossed the finish line, I couldn't wait for the next one. I signed up for the Escape from Alcatraz and haven't looked back. 3) What is your favorite thing about triathlon? Your least favorite? Favorite - I actually love the training aspects of triathlon; signing up for a race months in advance, setting a goal and working towards that goal. Also, since joining BTT, I love the camaraderie everyone on the team has and the support people show for one another. Least Favorite - Definitely the costs...between the equipment and the events, its gets very pricey! Being lazy; usually while eating. Often times I can be found relaxing in front of the television. I do have my favorite shows to watch but I could simply sit in front of the TV, relax, and watch just about anything. Memorable - Lake Placid Ironman. I had a strong race up until about 6 miles into the run. I began to feel really sick and was worried about not being able to finish. But I pushed through and was able to cross the finish line in 13:19:00. While I wanted to have a faster time, and plan to in 2012, my main objective was to raise money for cancer research and the Dana Farber Cancer Institute. I was racing in support of a friend who is unfortunately losing her battle with brain cancer. Through the generosity of my family, friends, teammates and even complete strangers, I have been able to raise almost $13,000 this year. Scariest - While sighting during the swim of my first Escape from Alcatraz race in 2006, a huge sea lion stuck his head out of the water right in front of me. It was so close, I honestly could have reached out and touched it. Instead, after air returned to my lungs, I turned 90 degrees, swam 25 yards to the left, and then continued my swim towards shore. 6) List three adjectives your friends would use to describe you. While my family always calls me crazy for competing in triathlon, I will let others describe me. 7) Do you have any role models or a favorite motivating/inspiring quote? Other than my traditional trip to the port-o-john 30 or so minutes before the gun, I am pretty boring on race morning. I don't have a ritual, don't listen to music pre-race, and don't eat anything exciting (usually just a banana, half a bagel and some Gatorade). ... that I have 4 degrees; Bachelors of Science (Marketing) and MBA (Management) from Boston College (1998 & 2001), JD from Suffolk Law School ('04), and LL.M. (Taxation) from Boston University ('07). I met Jeff Aronis through a mutual friend while attending a Red Sox game. 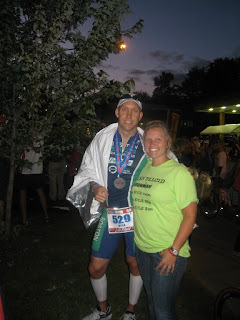 We got to talking about triathlon, my aspirations to compete in an Ironman, and eventually BTT. I had been training and competing on my own for 5 years, which can get very lonely. We kept in contact over the next year and I applied to join. Since joining, I have made many new friends and training companions. It was the best decision I have made; I only wish I had found out about the team years ago.